On Camera #16: Selma / Kumiko, The Treasure Hunter / Teenage Mutant Ninja Turtles / Glue / Thunderbirds Are Go! Ava DuVernay and David Oyelowo can consider themselves especially unlucky to not to find themselves in this year's Oscar nominations. The director and actor both excelled in 'Selma' (★★★★), a portrait of Martin Luther King's 1965 efforts to convince President Johnson (Tom Wilkinson to grant equal voting rights to all US citizens. Capturing the pivotal episode in the civil rights movement, where King and his supporters were met by significant (and often violent) opposition, DuVernay successfully transplants the viewer into the volatile world - the racial tension of the time feeling disturbingly relevant. It is English actor Oyelowo though, who shines more so than any other, channeling King with immense dignity and passion. Some aspects feel a tad forced as DuVernay seeks to ramp up the drama but as biopics go, this is certainly accomplished. Out today, 'Kumiko, The Treasure Hunter' (★) is a peculiar tale. An isolated Japanese woman (Rinko Kikuchi) who finds a VHS copy of the Coen Brothers' 1996 offering 'Fargo', believing the treasure buried in the film to be a real life event, proceeds to plot her journey from Tokyo to discover the riches at the expense of all around her. Thus ending up as one of the least sympathetic and troubled lead characters ever committed to film. 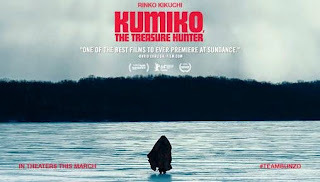 'Kumiko, The Treasure Hunter' proved continually frustrating. A reboot that no-one particularly wanted but equally, one that no-one should be especially mad about after the fact. 'Teenage Mutant Ninja Turtles' was released on DVD and Blu-ray in the UK this week, a fairly unoriginal origin story that sees them take on the might of Shredder with the help of Megan Fox's April O'Neil. That said, there's no artistic reason to return for an already pencilled in sequel, especially not when 'Teenage Mutant Ninja Turtles II: The Secret Of The Ooze' can never be beaten - Exhibit A: Vanilla Ice's Ninja Rap. Out next week on DVD is E4 TV drama, 'Glue', which Jordan FG covered in a previous Telly Text column - "a 'Broadchurch' for the younger generation", he said. And perhaps more pertinently, in the week that the big 'Eastenders' killer was revealed, Jordan stated that he was far more interested in the central murder in 'Glue' than who had murdered Lucy Beale. The 2015 Oscars take place this weekend. Refresh your mind with the nominees at oscar.go.com. 'District 9' writer-director Neill Blomkamp took to Instagram to announce that his latest project (following the soon-to-drop 'Chappie') is the new 'Alien' film. 'Batman Vs Superman' director Zack Snyder just tweeted the first image of Jason Momoa as Aquaman.